We designed this home with Basement Car Parking with the realisation that Residential Blocks are getting smaller on new developments. The Home is a perfect example of what can be achieved with the use of not only the ground above but also below. It make for a 3 split level home- Basement-Ground Floor-Raised Kitchen/Diner. The space that you gain on using this style of home is evident when you walk through the home. The home itself is a 4 Bedroom 2 Bathroom Multi Living Room & Basement Car Parking & Storage. The Style is Hampton with a touch of Boho making for a soft neutral tone. The use of Natural Light throughout all of our Designs is exemplified with high light windows. 2 Large picture frame windows are a prominent feature of the Front Elevation which house the Master Bedroom and Kitchen Dining. We have used Tasmanian Oak flooring with a Satin Water Based Finish and Travertine Style Tiles in the Bathrooms. Villeroy & Boch is prominent throughout the home with Argent tap ware to complement the basins and bath. Lining boards have been used in several areas to give the Hampton feel to both wall and ceiling. UPVC Windows are throughout the home which help us achieve a 7.4 Star Energy Rating. The external cladding is a selection of Acratex Render applied to 75mm Foam, Scyon Rock Face Stria & Silvertop Ash Timber. Velux Roof Lights are used in perfect locations to facilitate light and air flow at the same time. A Bold Statement of modern Architecture. This 4 bedroom, 2 Bathroom, Multi Living Room & Theatre Room is an example of Modern Design with Bright and Light Open Living Spaces. Double Storey Reverse Living with floating stairs and internal feature block walls. P50 skirting lines and a glass floor………The list is vast. Plywood feature joinery with a mixture of Caesar Stone and Plywood Laminate Bench Tops. The Villeroy & Boch basins are an Ultra Modern Thin Lined square feature of each Bathroom with Black Argent Tapware. Storage space is vast throughout the home with the Kitchen & Pantry having Drawers Galore. The use of AEG Appliances is next Level. The Theatre Room is a must see with its Bose Surround System making it feel like you at at the Cinema. Polished Concrete floors down stairs complete with Hydronic In Slab Heating, Wax Coated Tasmanian Oak Flooring to the upper level and stair treads. Velux Roof Lights are again used in several locations to enhance the natural light and ventilation. The Oxfordshire – Closing Soon! Our Display Home The Oxfordshire is yet another example of the Quality and attention to detail you can expect from your JM Home. The Design of this home is to show how easily we can deal with a sloping block hence the home is on a split level. As soon as you arrive at the front door you are met with features such as Spotted Gum Cladding picture framed by White Modular Blockwork with White mortar. The entry door and windows are black framed with black tinted glass giving the feeling of Luxury as soon as you enter the porch area. Upon entering the home you immediately see the beautiful polished concrete floor which is exclusive to JMHomes. Currently Closed, Please check out the virtual walkthrough tour by clicking the play button JMHomes Surf Coast first Display Home in Australia The Lancashire Prestige 25q 4 bedroom, 2 living, 2 bathroom. 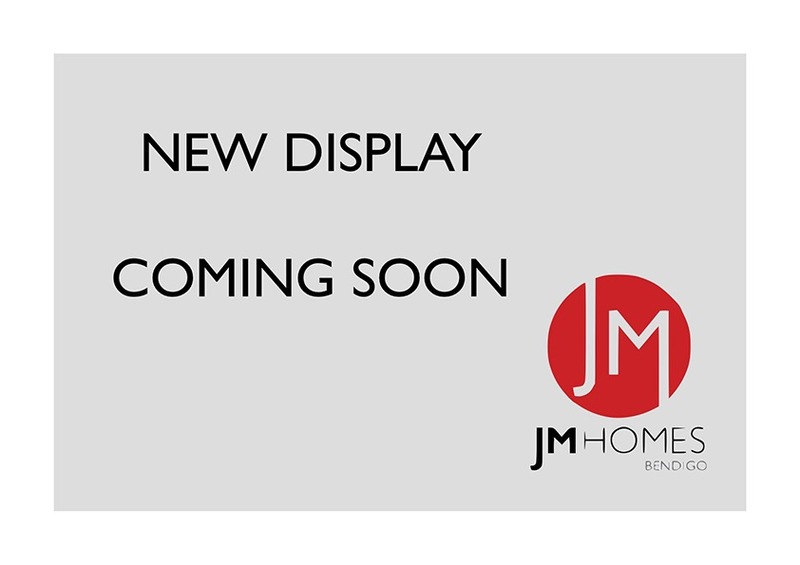 Currently Closed, Please check out the virtual walkthrough tour by clicking the play button JMHomes Surf Coast first Display Home in Australia The Lancashire Prestige 25q 3 bedroom, 2 living, 2 bathroom. Bright, open spaces created by raked ceilings and unusual angles are at the forefront of this design. The floor plan of this 4 bedroom home works exceptionally well with a large central living space and the second living to the rear. The master bedroom is set to the front of the home with the minor bedroom wing to the rear. Movement around the home is seamless allowing ample space to mingle while also providing space for quiet time if required. The quality of construction is complemented with superior fixtures and fittings including Argent tapware, Oliveri sinks and Villeroy & Boch bathroom fittings, as well as burnished concrete floors and Smart Stone Statuario Venato benches. The exterior of the house comprises 4 types of cladding – Spotted Gum shiplap, Foam render, James Hardie Stia board and Brick.